For the musculoskeletal system, the major periods of growth are the fetal and pubertal stages. Adaptations are common following injury and surgical treatment. The purpose of this chapter is to examine the reciprocal links between psychology and exercise—namely, the effects of psychological functions, such as motivation, on exercise—and the effects of exercise on psychological factors such as feelings of well-being, mood states, and mental performance. Biophysical Foundations of Human Movement, Third Edition, offers a comprehensive introduction to the anatomical, mechanical, physiological, neural, and psychological bases of human movement. Biophysical Foundations of Human Movement, Third Edition, introduces readers to key concepts concerning the anatomical, mechanical, physiological, neural, and psychological bases of human movement. The text provides undergraduate students with a broad foundation for more detailed study of the subdisciplines of human movement and for cross-disciplinary studies. Readers will learn the multi-dimensional changes in movement and movement potential that occur throughout the life span as well as those changes that occur as adaptations to training, practice, and other lifestyle factors. A new chapter on historical origins of human movement science provides students with an appreciation of the development of the field as well as its future directions. Content regarding exercise physiology has been reorganized to provide more discrete coverage of key concepts in nutrition. A new concluding section focuses on applications in the areas of prevention and management of chronic disease, prevention and management of injury, and performance enhancement in sport and the workplace, as well as the benefits of sport and exercise science to work, sport, and everyday living. Ancillary materials support instructors in teaching across disciplines as they assist students in understanding the breadth of content in this comprehensive text. Using a modular approach to teaching sport and exercise science, Biophysical Foundations of Human Movement, Third Edition, offers students a structured understanding of how the subdisciplines work independently and in tandem. Following a general introduction to the field of human movement studies, readers are introduced to basic concepts, life-span changes, and adaptations arising in response to training in each of the five major biophysical subdisciplines of human movement. Each subdiscipline is given a brief introduction, including the definition and historical development of the subdiscipline, the typical issues and problems it addresses, the levels of analysis it uses, and relevant professional training and organizations. Multi-disciplinary and cross-disciplinary approaches to human movement are also discussed along with contemporary applications. By studying the integration of knowledge from a number of the biophysical subdisciplines, students will be better prepared for advanced study and careers reliant on the integration of knowledge from various disciplines and perspectives. The third edition offers tools for retaining the material, including learning objectives and summaries in each chapter, a glossary, and lists of web-based resources. Throughout the text, special “In Focus” features highlight key organizations, individuals, and studies from around the world that have contributed to the current understanding of human movement. These features help readers appreciate the evolution of the field so that they may better understand its direction. Students interested in further study will find specialized texts for each of the subdisciplines listed in the Further Reading and References section of each chapter along with updated lists of websites. 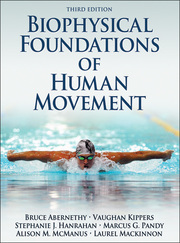 The third edition of Biophysical Foundations of Human Movement offers a comprehensive introduction for students, scientists, and practitioners involved in the many professions grounded in or related to human movement, kinesiology, and sport and exercise science. By considering the effect of adaptations in each of the biophysical subdisciplines of human movement, Biophysical Foundations of Human Movement also illustrates the important role physical activity plays in the maintenance of health throughout the life span. What is Human Movement Studies and Why is it Important? Is Human Movement Studies a Discipline? What Should the Discipline of Human Movement Studies Be Called? Primary textbook for undergraduate students in kinesiology, human movement, and exercise science courses; reference for academic libraries as well as researchers and practitioners in sport and exercise sciences, in particular exercise physiology, functional anatomy, biomechanics, motor behavior, and sport psychology. Bruce Abernethy, PhD, is professor of human movement science in the School of Human Movement Studies and deputy executive dean and associate dean (research) in the faculty of health sciences at the University of Queensland, Brisbane, Australia. He also holds a visiting professor appointment at the University of Hong Kong, where he was previously the inaugural chair professor and director of the Institute of Human Performance. He is also coeditor of Creative Side of Experimentation. Abernethy earned his PhD from the University of Otago. He is an international fellow of the National Academy of Kinesiology (USA), a fellow of Sports Medicine Australia, and a fellow of Exercise and Sports Science Australia. Stephanie J. Hanrahan, PhD, is a registered sport psychologist and an associate professor in the Schools of Human Movement Studies and Psychology at the University of Queensland, Brisbane, Australia. Hanrahan has over 20 years of experience in teaching human movement studies at the undergraduate level. She is a recipient of the University of Queensland's Excellence in Teaching Award. In addition to being part of the author team for the first two editions of Biophysical Foundations of Human Movement, Hanrahan has authored or edited nine other books. Hanrahan is a fellow of the Australian Sports Medicine Federation and a fellow of the Association for Applied Sport Psychology, for which she is chair of the organization’s International Relations Division. Hanrahan serves on the national executive committee of the College of Sport and Exercise Psychologists in the Australian Psychological Society. Hanrahan earned her doctorate in sport psychology in 1990 from the University of Western Australia. She resides in Moorooka, Queensland, and enjoys traveling, Latin dancing, and kayaking. Vaughan Kippers, PhD, is a senior lecturer in the School of Biomedical Sciences at the University of Queensland. He coordinates anatomy courses for students enrolled in medicine, physiotherapy, and occupational therapy programs. His major research involves the use of electromyography, in which the electrical signals produced by muscles as they contract are analyzed to determine muscular control of human movement. Kippers is a fellow of the International Association of Medical Science Educators and is on the board of directors of that association. He is also secretary of the Australian and New Zealand Association of Clinical Anatomists. Cycling and photography are Kippers’ main interests. He commutes on a bicycle daily and regularly participates in long rides on weekend. He is a former president of Audax Queensland, an international long-distance cycling association. Marcus G. Pandy, PhD, is a professor of mechanical and biomedical engineering in the department of mechanical engineering at the University of Melbourne, Parkville, Victoria, Australia. Pandy earned his PhD in mechanical engineering at Ohio State University in Columbus and then completed a postdoctoral fellowship in mechanical engineering at Stanford University. Before joining the University of Melbourne, he held the Joe J. King professorship in engineering at the University of Texas at Austin. Pandy is an associate editor for the Journal of Biomechanics and a fellow of the Institute of Engineers Australia, the American Institute of Medical and Biological Engineering, and the American Society of Mechanical Engineers. Ali McManus, PhD, is an associate professor and assistant director of the Institute of Human Performance at the University of Hong Kong. Her research focuses on the role exercise and free-living physical activity play in the health and well-being of children, the development of population measures of obesity and its associated health risks, and the provision of a more comprehensive understanding of the complex metabolic bases of exercise and physical activity in obese children. McManus earned her PhD from the University of Exeter, UK. She lives in Clearwater Bay, Hong Kong, and enjoys going to the gym, horse riding, playing tennis, and spending time with her children, Tash and Bella, and husband, John. Laurel T. Mackinnon, PhD, is a science writer and editor based in Brisbane, Queensland, Australia. She is also a former associate professor and now adjunct associate professor in the School of Human Movement Studies at the University of Queensland, Brisbane, Australia. Mackinnon conducted research on the immune response to exercise in the 1980s and 1990s and is internationally recognized for her work on overtraining and immune function in athletes. She is the author of 6 books and 12 book chapters, including Exercise and Immunology (Human Kinetics, 1992), the first book to explore the intriguing relationship between exercise and immune response. She has published over 65 peer-reviewed articles in international journals. Mackinnon has worked since 2000 as a science writer and editor. She is editing team manager for OnLine English, an Internet-based service that specializes in editing academic, research, and industry communications written by non-native speakers of English wishing to publish in English-language scientific journals. Mackinnon is a fellow of the American College of Sports Medicine and a member of the Australasian Medical Writers Association. She is a former board member of the International Society of Exercise and Immunology (ISEI) and the Australian Association for Exercise and Sports Science. Mackinnon earned her PhD in exercise science from the University of Michigan. She enjoys exercising, reading, and listening to classical and jazz music. Mackinnon resides in Brisbane, Queensland. "The book is made up of standalone sections that make reading easy and understandable. The authors are well-respected scientists in the field, and the information they provide throughout originates from evidence-based research." All ancillary materials are FREE to course adopters and available online at www.HumanKinetics.com/BiophysicalFoundationsOfHumanMovement. Instructor guide. Includes a sample course syllabus, learning objectives, and teaching tips and suggestions for class projects. Test package. Includes a bank of more than 300 questions. The test package is available as a rich text file through Respondus software that allows instructors to create their own tests by selecting from the question pool. It may also be used through a learning management system such as Blackboard or Moodle. Image bank. Includes all of the figures, tables, and photos from the text, sorted by chapter, and can be used in developing a customized presentation based on specific course requirements. The image bank is also available for purchase • ISBN978-1-4504-4225-1.